His voice shakes as he says: "Eagles, I promise you. I will hug each and every one of you as many times as you need"
Ty Thompson, the principal at Stoneman Douglas High School delivered an emotional message on YouTube Saturday. The principal of Stoneman Douglas High School in Parkland delivered an emotional message of strength and hope Saturday. Ty Thompson, named one of six semifinalists for the 2017 Principal of the Year for Broward County Public Schools, posted a video on YouTube in response to the shooting that took place on his school’s campus Wednesday afternoon that left 17 people dead. In the video, he thanked his staff and students for their heroic efforts in instituting their procedural protocols. “I believe lives were saved thanks to those protocols,” said Thompson. He then thanked first responders for their quick and large response. Thompson continued by thanking the school district, local, state and federal officials for their support. He then thanked the community for their outcry of support via e-mail and social media. “We lost 17 lives on Valentine’s Day. That’s supposed to be the international day of love. We’re going to take the love we lost on Wednesday and we’re going to spread that over the next day, weeks, months – maybe even years,” said Thompson. 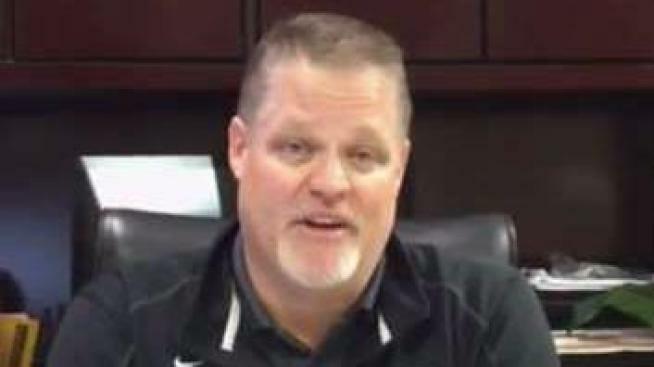 Thompson – who has been the principal for Stoneman Douglas for about five years and has been with the school for nine years – then delivered an emotional message to his Eagles family. His voice shakes as he says: "Eagles, I promise you. I will hug each and every one of you as many times as you need. And I will hold you, as long as you need me to, for all 3,300 of you and your families. And we will get through this together."